Today was a day filled with teaching and questioning for Jesus. He spent most of his day teaching in the Temple. However both the Pharisees and the Sadducees were watching him, waiting for him to make a mistake. They even asked him question in order to trip him up. They ranged from “Is it right for us to pay taxes?” to “Is there marriage in the Resurrection?” With each question, Jesus had an answer that not only put them in their place, but also was good for teaching the people about the Kingdom of God. Then in Matthew 24, Jesus takes his disciples out to the Mount of Olives and teaches them about his return. It was on this day the High Priests decided they had had enough of Jesus and decided to capture him in secret and kill him (Matthew 26:4). It is possible that this is the day Judas met with the priests to offer them Jesus Christ. The teaching of Jesus that I love on this day comes from Luke 21: 1-4. Jesus reminds the people hat we must give our lives to God, not just what we can do without. They saw rich men putting their gifts in the offering plate. They were clearly giving only what they were obligated to give and not anything more. Then there was a poor woman who gave only 2 pennies. 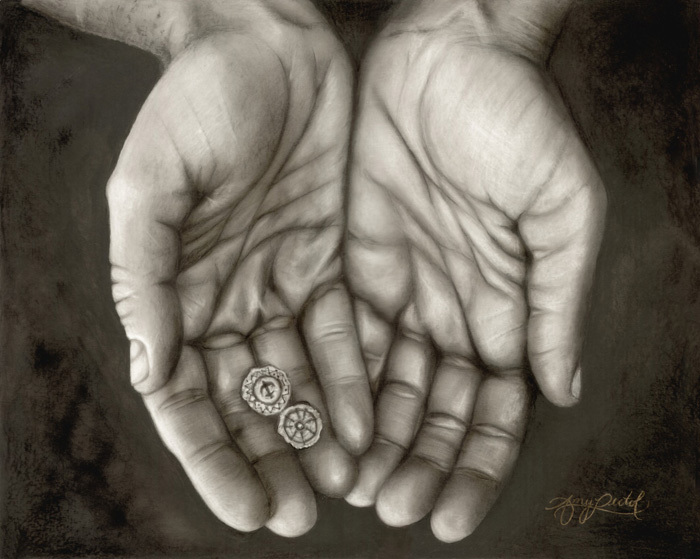 Jesus tells the crowd, “Truly I say to you, this poor widow put in more than all of them; for they all out of their surplus put into the offering; but she out of her poverty put in all that she had to live on.” (Luke 21:3-4, NASB). Her act was essentially placing her life in God’s hands. She had no idea when the next time was that she would have money, but she knew she had to give something. So she chose to give it all. What could you give? Could you give it all and trust it all to Jesus? Let’s think about this today on this third day of this Holy Week. Well everyone, I’m back and both baby and my wife are doing excellent! I thought that for this week we would look through the final events of Jesus’ life as we observe Holy Week. 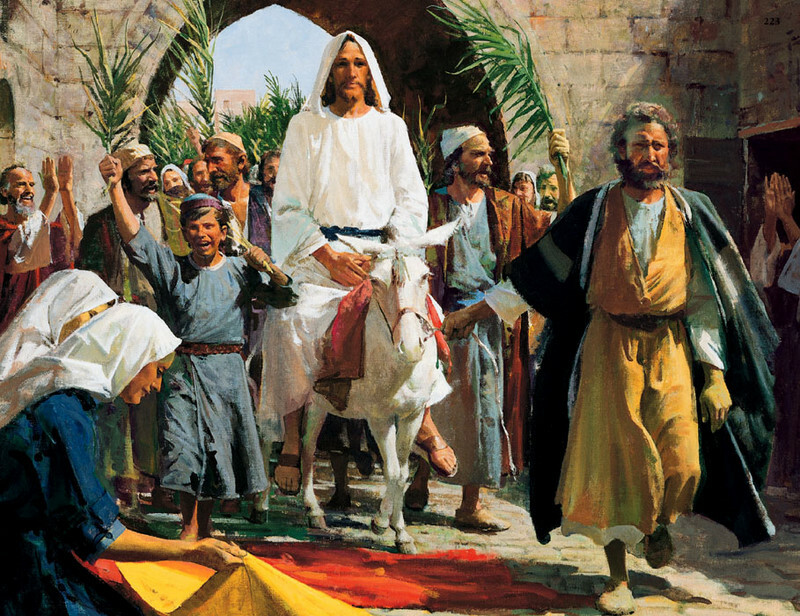 However, I am starting this a day late so we will be taking a look at the events of both Palm Sunday and Monday. After these events, Jesus went into the temple in order to have a look at the environment. However he soon left to go back to Bethany, which was were he and the disciples stayed during this final week of Jesus’ life. After 3 years of ministry, today is the day that Jesus makes his final push for the people to come to realize the truth about God and His Kingdom. When he entered the temple, undoubtedly to teach, he saw a sight that he absolutely despised. He saw people, inside the temple, selling animals and other sorts of merchandise, and people who were taking peoples money either with taxes or exchanging currency. Jesus tells the people, quoting Jeremiah, “It is written, ‘My house shall be called a house of prayer’; but you are making it a robber’s den.” (Matthew 21:13, NASB). He then drove them out with a whip of chords he made, and by turning over their tables. Both of these days were also filled with teaching and healing. I think it’s nice to see the events of Jesus’ life as his time on earth came to an end. Join me tomorrow as we continue onwards. As we finish up the book of Judges, we see that Israel really hasn’t changed during their war on the tribe of Benjamin. The book ends with the phrase that has been used a few times in the last chapters, “In those days Israel had no king; all the people did whatever seemed right in their own eyes.” (Judges 21:25, NLT). The people of Israel felt bad that they wiped out a tribe of Israel, so they sought to get wives for the survivors of Benjamin. They were trapped by an oath they had made that none of their daughters would marry Benjamites. So they looked for people who had not joined in the war and made the oath with them. The area of Jibesh-gilead had sent no one to the war, so (based on another oath) the people of Israel went to Jibesh-gilead and killed all of the people except for the women virgins. These women were to be given to Benjamin as wives. However there were not enough women for the surviving men. So Israel instructed Benjamin to wait in the vineyards near Shiloh and take the daughters that came out to dance at the festival. We end the book of Judges with a differing opinion of what is right. God commanded the evil be eradicated from the land of Israel. So He commanded that Benjamin be destroyed. After their success, the people felt bad that an entire tribe of Israel had been destroyed. So they sought to make it better. The people’s opinion of what was right is that Benjamin must survive their destruction. They felt terrible for Benjamin’s situation, but sometimes that’s the consequence of disobeying God’s Laws. So here we are left with a question that I feel flow throughout all of Judges. Is it better to trust and follow God, or our own desires? This question has plagued humanity ever since it’s creation. We read in the beginning, that there was a tree God commanded Adam and Eve not to eat from. “The woman was convinced. She saw that the tree was beautiful and its fruit looked delicious, and she wanted the wisdom it would give her.” (Genesis 3:6a, NLT). They both chose to follow their own desires, and not what God had planned for them. Ever since that day, we have all been faced with the question of who knows best for our lives. As I was saying yesterday, the cost to follow God is large. It’s so big that many of us don’t want to pay it, and we don’t want a gospel message that asks something from us. We would rather keep Jesus at arms length, and not allow him to get close. But Jesus tells us, “If any of you wants to be my follower, you must turn from your selfish ways, take up your cross daily, and follow me.” (Luke 9:25, NLT). Right there Jesus lays it out for us what it takes to be a follower of God. 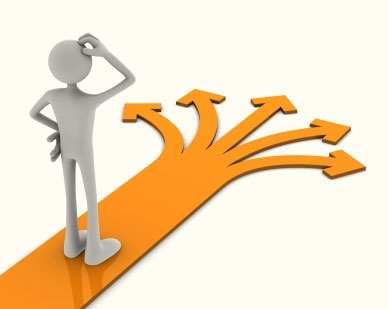 We must turn away from the things that we desire, and focus on the things God desires. We must die to ourselves and our sin. Then we must follow Jesus Christ. So it comes down to a simple point. We can either choose to follow a loving God that brings order to chaos, or we can trust our sinful desires that do nothing but create chaos. Which would you chose? There is an idea out there that I have heard called “The Secret Place”. Essentially this idea comes down to, “how do you spend time with God?” It means to intentionally take time out of your day, and spend it intimately with God, alone. The New Testament is full of times where Jesus goes off, by himself, and spends the time in prayer. It’s almost always used as a way for him to regain or acquire strength for the coming events. There are two times that really stick out to me. The first is just after he feeds the multitude. After performing the miracle with bread and fish, and preaching to the multitude of people, Jesus finally sent them all away. Then he sent the disciples across the Sea of Galilee ahead of him. Jesus the went up a mountain, by himself, in order to spend time in prayer (Matthew 14:23). The second time is in the Garden of Gethsemane. The night before Jesus was arrested he took three of the disciples with him, told them to stay put, then moved away from them to be alone (Luke 22:41). I hadn’t really ever given much thought to my alone time with God until quite recently. I always thought that I was doing pretty well if I made sure to read my Bible everyday. But I wasn’t getting the refreshment that Jesus received. I wasn’t sure what I was doing wrong. Then God stirred in my heart the answer, I have intentionally make time for God. Our relationship with God must be on purpose, otherwise it isn’t a real relationship. It’s the same thing we do with our relationships on earth; our friends and family must have time made for them otherwise they get neglected. The same is true for God. Back in March, my wife and I went to the Burning Lights tour with Chris Tomlin and Kari Jobe. I felt refreshed after that, so I felt that was what I needed to do. Find some time that I can go to worship that isn’t me leading it. But quickly I learned that wasn’t the answer. This past Saturday night I decided that I had to start being intentional. So I set my alarm for 5 am, I had to lead two services in the morning, so I had to wake up early anyway. So I woke up, made some coffee and sat down with my Bible. My entire day went differently! Worship was great! I felt good, because I connected with God first thing. I am now on the fourth day of this “experiment” and it’s quickly becoming something I yearn for. This morning, I went on my back porch with my coffee and Bible, the brought out my guitar and started worshiping. That completed it for me. 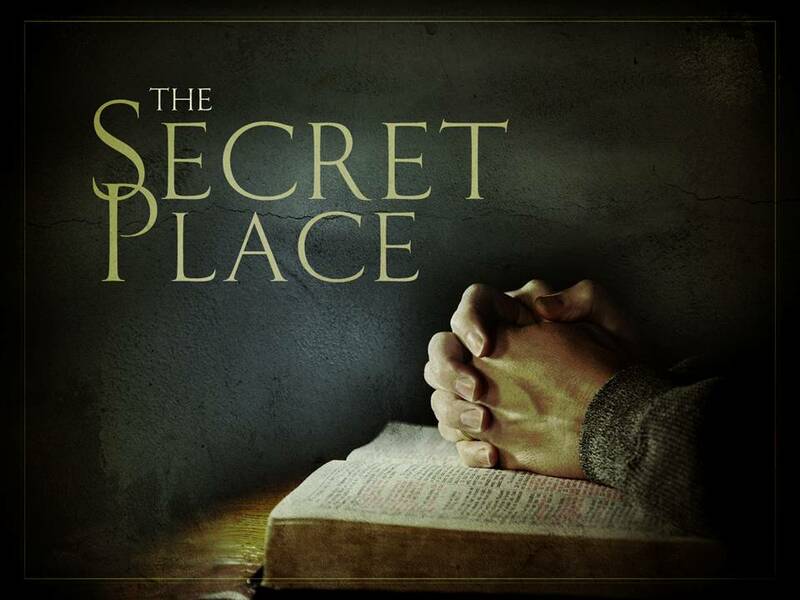 So I encourage you to find that Secret Place, and intentionally spend time with God. This is where we can learn about the heart of God, and His will for our lives. It refreshes us and fills us with living water. My experience has been great, and I hope you will at least try it for a few days like I have. And have fun with it, God is your friend, so be His in return! I’m putting a song by Kutless up here. It’s called Take Me In. I think it really fits with this post so listen and enjoy!